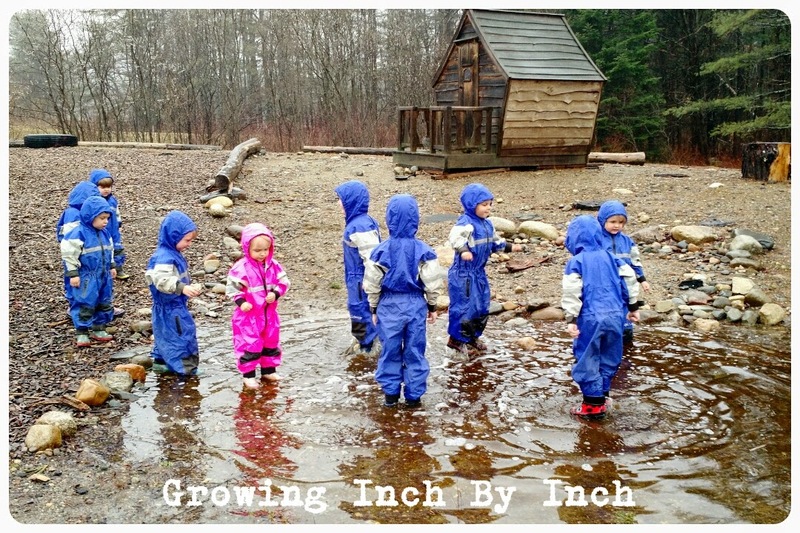 Outdoor Play Party - Guest Post from Growing Inch By Inch. 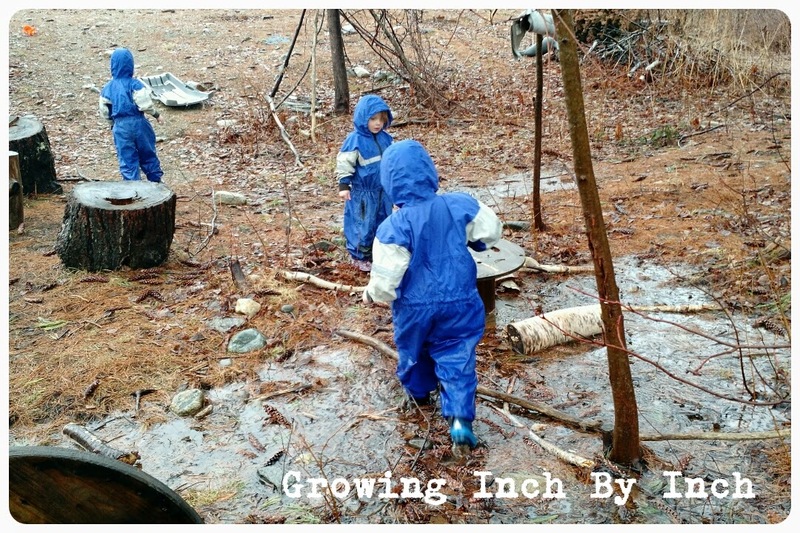 For the latest Outdoor Play Party I am delighted to welcome Jessica Lewis Owner & Lead Teacher at Growing Inch by Inch Preschool in Maine. Jessica and I have been friends through social media for a couple of years now and I love watching the adventures her charges get up to in all weathers.Here Jessica celebrates the start of Spring after a long, long snowy Winter! 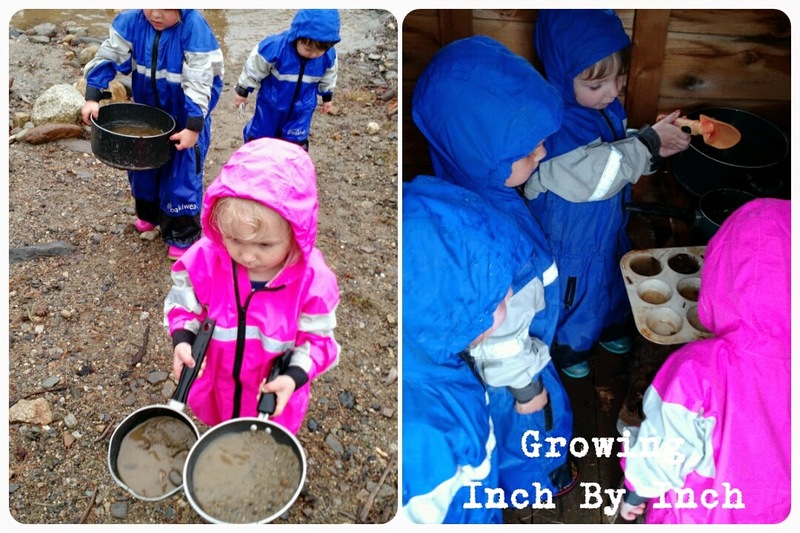 I could take a million pictures and videos of the children playing in their rain suits. I could watch them all day long. To me, those suits represent the feeling of freedom. Free from the snow and the long winter! Free to be wild and messy! 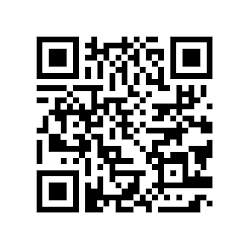 Free to discover and explore! 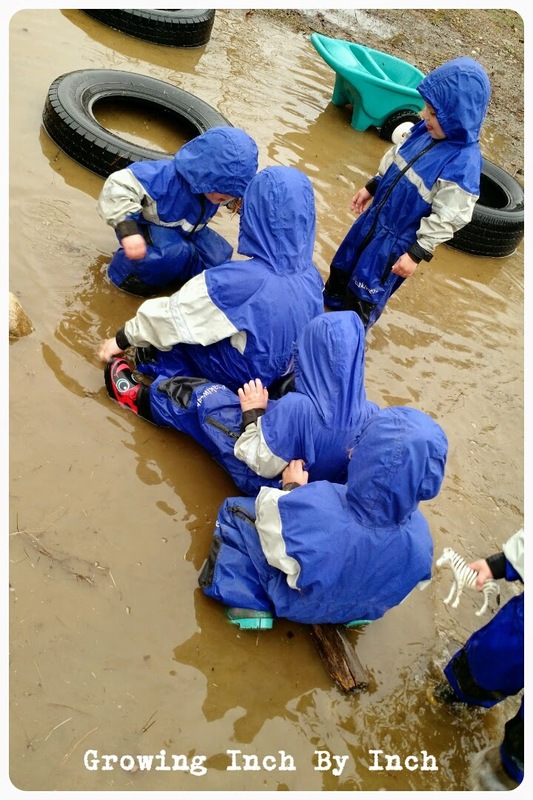 Something about those rain suits gives the children the freedom to be children! Free to laugh and have fun! And that is something I could watch forever! 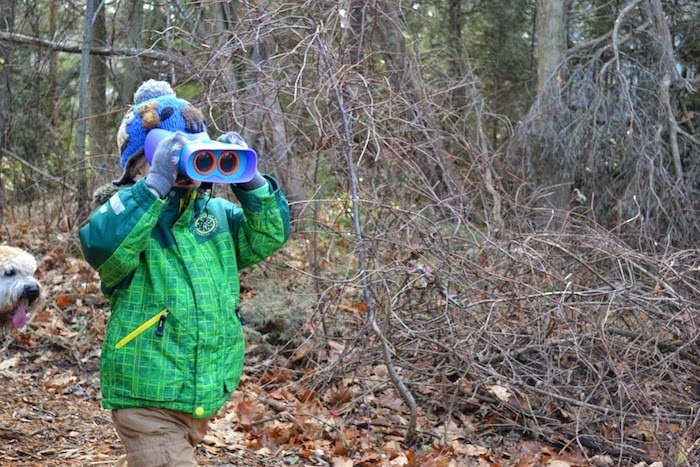 My favourite post from the last link up was from a lovely new blog to me: Hen Family: I loved this post about how to enjoy being outdoors all year round; Getting Outside in All Seasons. 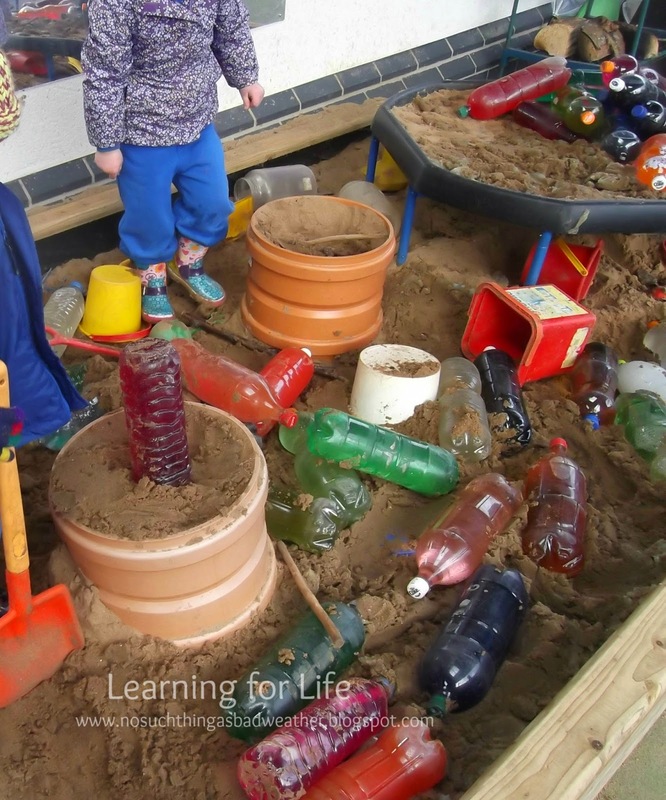 "Now it’s time for this week’s Outdoor Play Party. We would appreciate it if you included a link back to this post (either in your post or sidebar) to help us spread the word about the importance (and fun!) of outdoor play! In return, we’ll gladly further share your post on Pinterest. Please feel free to grab the Outdoor Play Party button from the sidebar and/or include a text link back. Please note that by contributing you are giving permission for an image and link to your post to be republished if featured. (If you have been featured, please feel free to grab the ‘featured at’ button from the sidebar.) 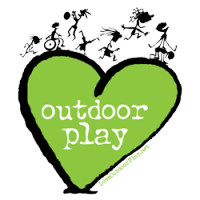 Share your ideas for outdoor play activities with us every other week!" A panorama of Bear Woods -showing the nursery & main school below & beside it. We have an amazing scrap store in Belfast: The Play Resource; that offers busaries to schools to allow them to have professional artist come in to work with the children. Over the past 7 years we have availed if this scheme and the nursery is full of fabulous one off pieces of art work the children have created during this time. This year I was lucky enough to secure the services of artist Fionnuala Duffin & when we chatted about what she could do with the children, I mentioned wanting to have some large scale outdoor art for Bear Woods & the playground. Fionnuala will be working with the class over 4 days this month, a Friday & a Monday. On the Fridays we will actually create the art up in Bear Woods & then on the Mondays make some more pieces to add to Bear Woods or for the playground. I had to send Fionnnula photos of the type of fencing we had etc. so she knew what materials to bring with her. The finished woven sea scape with lovely boat bobbing along. Today we had our first session up in Bear Woods and although it was dry it was a little chilly to start with. As Fridays are our outdoor days before we went up to Bear Woods we had made some creme egg popcorn, the children had declared this sticky & delicious! After this lovely gooey treat we all headed up the hill to see Fionnuala. At the moment there is some building work going on in the main school playground so the children can't run ahead anymore and they know they have to walk with or behind the lead adult. There was also great excitement because there was a new shed in the space too. This is for the gardening club but it will provide 3 wooden walls for us to 'play' with and eventually make a shelter off plus it has provided a proper home for our camping toilet. Fionnuala had lots of strips of coloured material and she had clearly marked a top and bottom to the piece so the children could see where to weave. They had lots of fun doing this & some spent the whole session engrossed in the activity whilst others just dipped in and out. 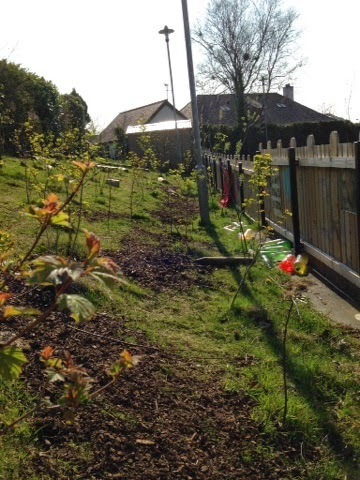 Eventually the sun came out and we decided to make a path using bags of bark chippings. 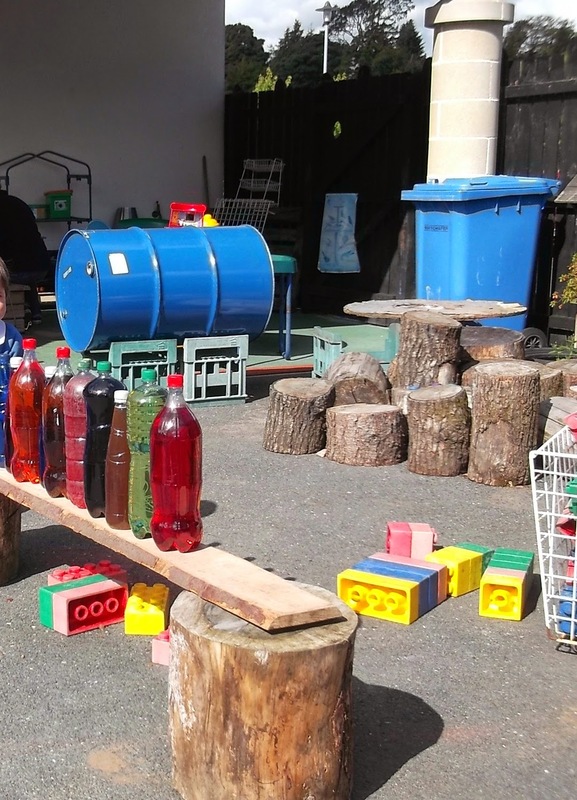 Of course some of these became extra 'loose parts' for play as they were moved about in some of the dumper trucks that stay up in Bear Woods. 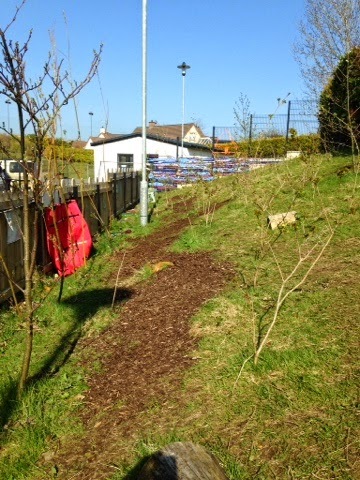 The path created using bark chippings. 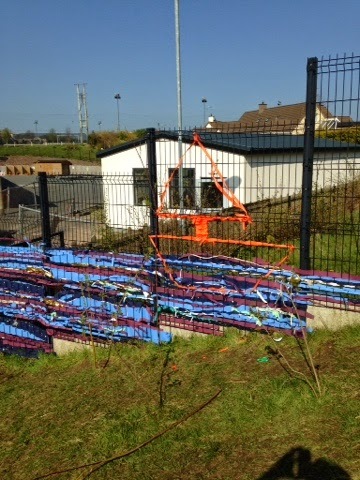 When we all had to go back down to nursery for lunch, Fionnuala finished off the woven sea score by adding a lovely orange boat. 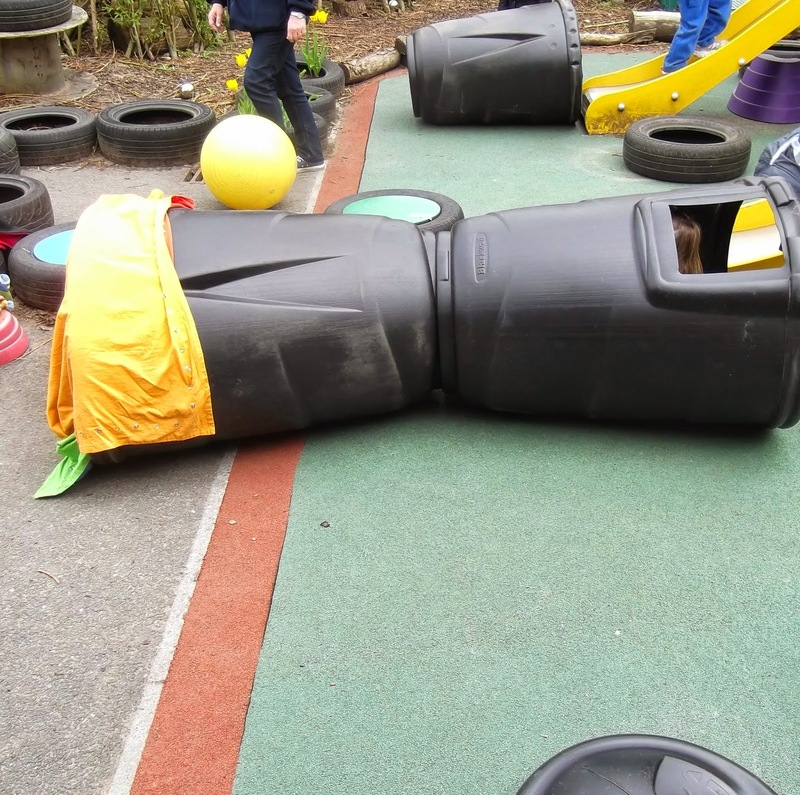 The children were very excited to see it when they went outside to the playground after lunch, that is a huge advantage of Bear Woods being just above the nursery. On Monday we hope to make some jelly fish and decorate CDs to hang around the playground to brighten up dark mornings. Outdoor Play Party - enhancing a play space. I recently had time to reflect on how our playground had evolved over the past 9 years and whilst it is true we have added lots of new 'stuff' to the space, none of it has cost any money. The initial outlay of costs had happened before we moved into the new school - with the safety surface, tarmac, grass and fixed equipment. Then for the past 9 years as we have added to the space it has been donations of logs or tree stumps, bark chips or grass cuttings. We are all in 'finder' mode all the time, so when one assistant visited her mother who was gathering up all the leaves and beechnuts in her garden, she knew these would be perfect to add to our forest area. The Bottle Babies enhance play in so many ways & are essentially free, especially if you can persuade parents to gather them up for you & then you just fill me with things you have lying around anyway - old pen lids, straws, sequins or glitter etc. 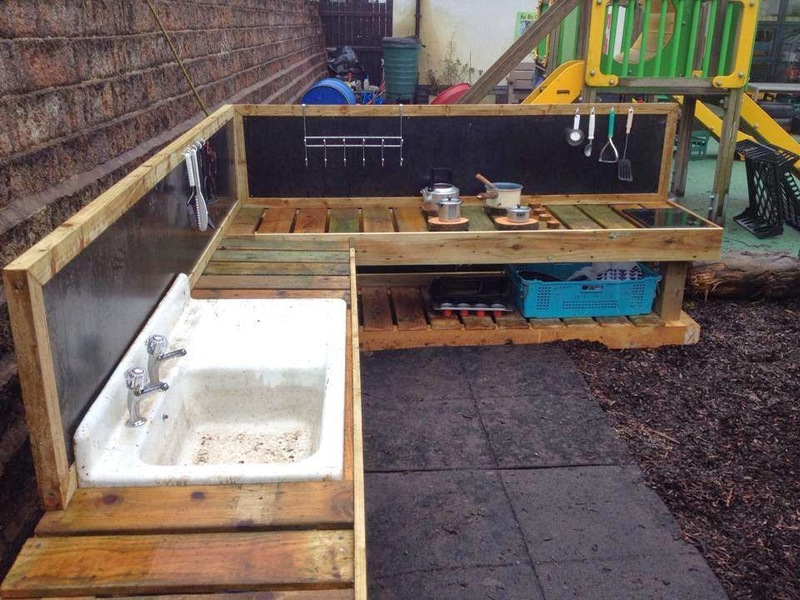 The mud kitchen which is our biggest fixed asset added in the last year was kindly built for us by a friend and a very willing parent who provided all the materials. As I said in the last Outdoor Play Party, this element has created a whole new layer to the play outdoors, as the children enjoy cooking and preparing so many meals for us and each other on a daily basis. In third term we introduce the big compost bins as another resource for the children to incorporate into their play. The biggest message I would like to get across to all those who are developing their outdoor space is to try and create as much as you can for as little as possible. We all know the term 'loose parts' now and it is these movable pieces that provide the best resources to enhance play. If they haven't cost a lot of money then you will be less inclined to worry about the children moving them around or incorporating them into various play scenarios. From the last link up my favourite post was from Cuddles & Muddles on the simple joy of running. 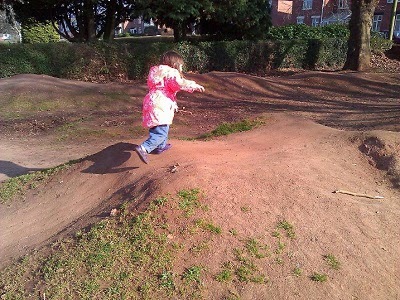 There is nothing as joyous for young children as having the freedom to just run up or down even the slightest incline. My reasons for fixed equipment in the playground. I was speaking at a conference last month on getting children outdoors & before it started one of the other speakers and I were chatting over coffee. Annie was over from England and wanted to get a 'feel' for typical playground set ups in Northern Ireland, she asked me how I felt about fixed equipment. This is a hot topic for many schools, 5 years ago big climbing structures or slides were discouraged; the argument being they don't allow for progression whereas more recently new settings are installing them again. After thinking about our slide, I had no problem saying that if I had to go back 9 years to when we moved into our new space, I would still invest in a piece of fixed equipment. Here are my reasons, our playground is quite unique as far as school settings go, it looks very different to the average playground that small children and their parents are used to. Therefore the slide provides something familiar to the children when they start with us, just as settings have home corners inside for the children to feel comfortable in the alien school environment, the slide does the same outside. Most children coming into nursery have heard the following messages 'Put that stick down, don't play with dirt, don't pick THAT up, be careful' etc. etc. so when presented with our playground it could be overwhelming. 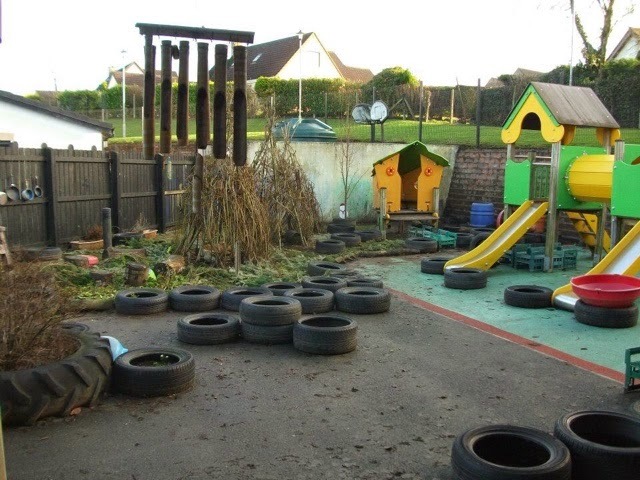 We have lots of sticks, logs, tree stumps, mud, bark chippings, tyres and other 'loose parts' that the children do begin to interact with and weave into their play as time progresses but first they need to see something they recognise and know how to play with and this is where the slide comes into play. 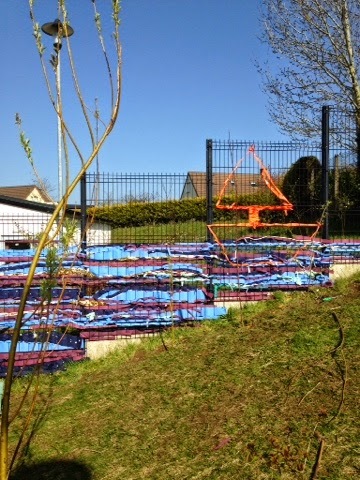 When confronted with a playground like this, children and parents need to recognise something familiar! Sometimes this is the first time a child lets a parent out of sight, when they climb up the steps and go through the tunnel to go down one of the slides. It is also where they first begin to interact with their new peers. I also firmly believe that it does allow for progression, some children spend the whole of first term trying to get up the slide! Their play differs from term to term as they incorporate the slide into their scenarios, it can be anything they want it to be - a ship, a rocket, a house etc. The tunnel provides a quiet space for children to hang out just chatting to each other. 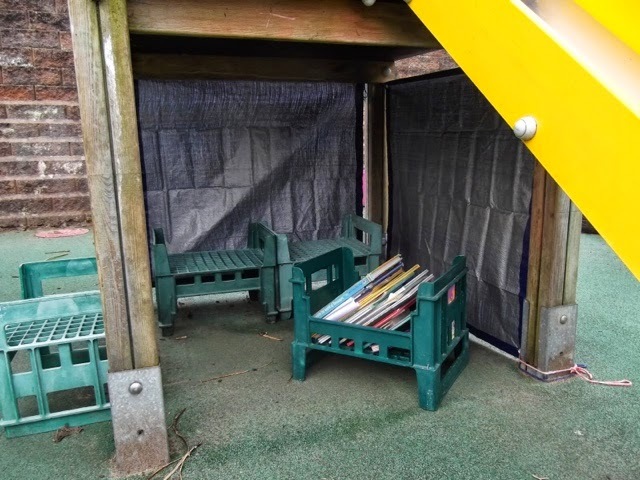 We have created a reading space underneath it and this space is always in use. They love to discover the joys of creating a water slide by pouring water down it for friends to whizz past them & it takes a certain skill to come down a very wet slide on a rainy day & manage to stop at the bottom! Another big factor for advocating for fixed equipment is the set up involved in an engaging outdoor space, it already takes us around 20 minutes to set up without having to unpack and build a wooden climbing frame or slide, not to mention it saves our backs. So, yes, in answer to Annie's question, I am firmly in favour of fixed equipment being used a piece to enhance an outdoor space but I don't think it should be the centre piece instead it should provide a backdrop to a much wider play experience than an ordinary standard playground could ever offer. The reason many playgrounds are underused it not because the equipment is useless but because it is not enhanced by moveable loose parts.